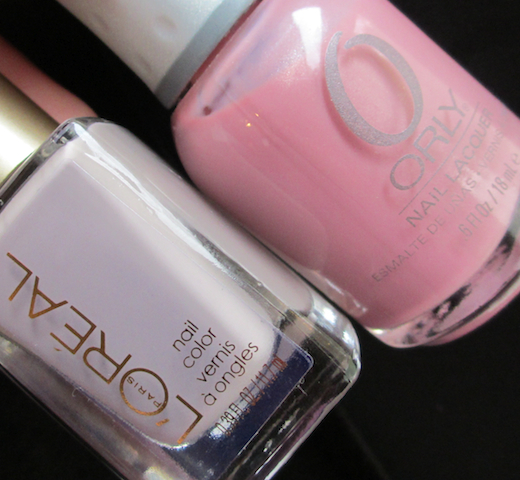 iHeartPrettyPolish: L'Oreal Eiffel For You and Orly Artificial Sweetener Go Pink Wednesday! L'Oreal Eiffel For You and Orly Artificial Sweetener Go Pink Wednesday! For my second "Go Pink Wednesday" Post (for more information or to participate, click the Go Pink button on my sidebar) I am featuring Orly Artificial Sweetener and L'Oreal Eiffel For You (accent nail). As you can see, Eiffel for You is an awesome dupe for Essie Chinchilly (comparison post here) It is way more opaque, a great formula...and a lower price! Orly Artificial Sweetener is a bit more sheer than I like, but it's still very pretty after a few coats. It has tiny pink shimmer that sets it apart from a plain cream pink. Sorry about this quick post - I am running out the door to bring my daughter to gymnastics. I'm also very annoyed because I screwed up my cuticles last night and had a heck of a time getting a picture that didn't accentuate them. Let's just focus on the pretty polish, okay? ...although, the polish is washed out in this photo too - believe me, it looks great in real life. Have a great day and don't forget to check out the rest of the participants! That is a pretty dupe for Essie's chinchilly. I love the combo of that with artificial sweetener! Yes, it's a great dupe....although, this pic doesn't show it well since it's so washed out. ....did I mention I am totally annoyed with this swatch? argh. I know, I love those two colors too - I sure wish the photo turned out better. It's washed out, but that's the only way I could work the camera so it wouldn't show the cuticles as much. I took like 9 million pictures and this is the only one that hid the cuticles - sortof. It's times like these I wish I had photoshop! This is such a nice soft combination. I am going to have to check out that Loreal as I don't have Chinchilly and I always eye it when I look at Essie. BTW, I don't see a problem with your cuticles. I know this time of year can be rough in the area we live as it seems very drying. Yes, the L'Oreal is a great dupe. You will be very pleased with it if you end up picking it up. I'm glad you don't see the problem with them...that means I got the camera angled correctly - but this picture is so washed out, you can't see much of anything! LOL, not my finest work. Note to self...DON'T MESS WITH CUTICLES! I tried pushing them back last night and it just ruined them more. I love pink and grey together! They make such a pretty combination! I've never thought of combing pink and grey in a mani but they look so great together. I'm in love with that pink by the way. Super pretty! "not as bad as you think they do"...good, that means I chose the right photo that hides it! LOL. Thanks though. No....I didn't take it that way at all. I quoted you - I didn't mean "you" and in you. LOL. Ah the joys of communicating online! :) I know exactly what you meant and you didn't sound like an @$$ at all. *as not and.... wow, let's just pretend none of this happened! ha. I love pink and grey together. It is such a classy, Audrey Hepburn kinda look! I don't have very many greys in my collection and might have to check this one out! Artificial Sweetener is one of my favorite pinks! Cuticles?? What cuticles?? Lol. Yes, Artificial Sweetener is a really pretty pink. Oh those cuticles are there...I just chose the right photo so you can't see them as much.